Miura’s new MW regeneration process is designed to deliver a more consistent, highly softened water supply, with the added reliability of double tank alternation, our system integrated Colormetry hardness detector, and a control panel that interfaces with Miura’s MOM and ER dashboard systems. 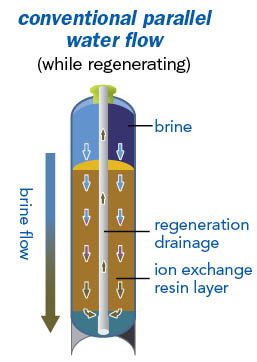 As brine circulates from top to bottom, it absorbs the hardness released from the resin, but does not fully regenerate the bottom portion of the layer. The MW will automatically engage a 24 hour regeneration for each tank in the event the integral water totalizer is compromised. 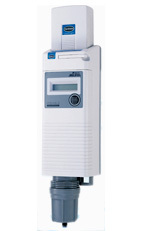 (Connection from a makeup water solenoid valve is required). If Colormetry detects hardness leakage, it sends a signal to the boiler’s hardness alarm contactor, and will automatically switch tanks to continue to supply softened water. The control system interfaces with the boiler controller to initiate automatic blowdown after receiving hardness alarms. Monitoring the brine flow rate with a flow meter at the brine input line, the MW prevents hardness leakage by managing regeneration of the brine amount and detecting brine introduction failure. 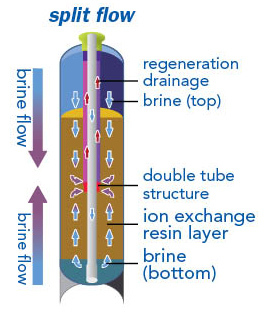 A brine concentration sensor monitors the specific gravity of the brine, detecting the status of the regenerating salt and preventing regeneration failure in the event the tank is allowed to run empty. Water hardness is a common cause of boiler damage. Typically, water-hardness levels are checked manually through the use of chemical reagents. Such measurements are timeconsuming and can result in incorrect readings. Colormetry solves all these problems by offering automated reagent injection, mixing and evaluation integrated into the boiler control system. 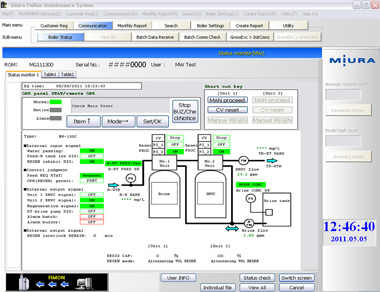 The MW system is fully compatible with Miura’s PC dashboard monitoring systems, as well as third-party PLC integration (Modbus & BACnet), to further enhance oversight of softener performance. Integrating the softener system into the comprehensive boiler controls/ monitoring system maximizes operational awareness and provides real-time boiler water quality management, acknowledging its role in supporting overall system optimization.